Ba Da Da Hei Shan Pu-erh Cha was produced using rare wild arbor tea leaves harvested during early spring season from Ba Da mountain areas in Xishuangbanna region. This mountain is home to some of the oldest trees in the world, including the ancient 1,700 years old "King of Tea Tree". The tea was originally stored in a bamboo basket packaged at 6.5 kilograms per basket. Ba Da Da Hei Shan Pu-erh is valued for its bitter taste (not unpleasant) and strong aftertaste that leaves a slight hint of honey-like sweetness in your mouth. 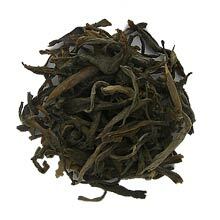 Large tea leaves with bud and stem. The liquor is orange in color.